Amid the rancour, there was levity. In the press conference room in Stadium Wroclaw, Polish faces were perplexed by the subject matter of Martin O'Neill's briefing. Most of them understood English perfectly. Others were listening through headpieces which were pumping through the translation. They might have expected a line or two about tonight's friendly match but instead the visitors were consumed by social media messages and betrayal, by discussion on the merits of industrial language and a 'Reeling In The Years' style discussion of Roy Keane's angry back catalogue. 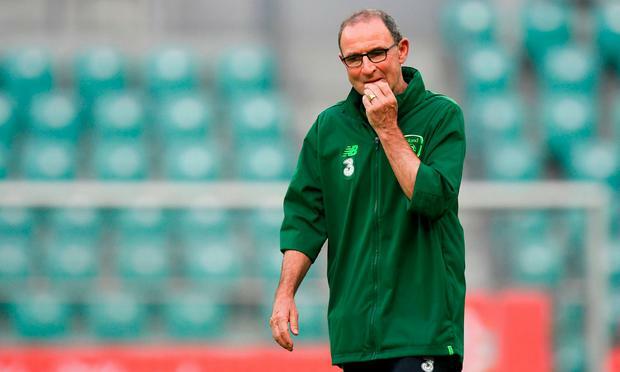 Martin O'Neill was a little tetchy when the subject of Stephen Ward's leaked WhatsApp audio message was initially raised but, by the end of a lively 35-minute chat, he was actually succeeding in putting a brave face on it. He shared a joke with a local hack who had conceded he was frantically reading up on the internet to find out what on earth it was all about. O'Neill asked him if Robert Lewandowski would be worried about Irish woe. The Pole's response was razor-sharp. "I'll send him a WhatsApp message," he joked. O'Neill smiled. It's safe to say he wasn't doing too much of that yesterday morning when Ward's audio message started doing the rounds. The 66-year-old says that the Burnley player was "betrayed" by close friends. It is believed that he recorded a version of what he'd heard about Keane's summer row with Harry Arter and Jon Walters and sent it to a group containing a handful of close pals. Evidently, one of them chose to share it with a wider audience and it went from there. With a click of a button, the assistant manager's temperament had shot straight back to the top of the news agenda. O'Neill said that Ward's version of events did not tally with Keane's - and we know that Ward's details are second-hand because he missed the summer get-together due to injury. Nevertheless, the finer points of his three-minute clip were generally in keeping with the skeletal version of the skirmishes around the games with France and USA. Specifically, that Keane took issue with Arter and Walters sitting out training following a season where they had barely played. The audio clip put meat on the bones. Walters confronting Keane over his comments and later asking him to his hotel room to sort their troubles out, an invite that was declined by the number two who had earlier referenced a physical confrontation between the pair when they were at Ipswich. But it's the Arter business which is the most damaging because he has signed himself out of duty as a consequence, whereas Walters played in Wales. "It's hard to put a good spin on a first-team player alleging that the number two had called a squad member a 'f***ing prick" and a "c**t" who didn't even care about training. The additional detail involved Arter leaving a room with Keane shouting from behind about how Arter had been both of those things for all of his life. "It didn't come to blows," Ward stressed. "But just basically Roy losing his head." This was fairly extraordinary stuff and it's understood that Ward was contacted by both O'Neill and Keane as the private missive spread into the wider world. O'Neill confirmed discussions with the absent defender took place but did not go into detail. The Irish Independent understands that Keane was furious with Ward and seeking a solution to the problem. But there was little which could be done at that juncture. The Derryman acknowledged that Keane was unhappy. "I think Roy initially was a little bit disappointed and I think he's going to speak to Stephen later on but it has all happened today," he said. "I'm the one doing the press conference today but at some stage or another, he (Keane) will be happy to go through it with you." O'Neill eventually left the audience with the impression that Keane has a few other discussions to deal with first. The suggestion that he is ready to hold talks with the exiled Arter - and O'Neill responded positively to a question which indicated this might involve an apology - suggested an awareness of the seriousness. Around the defeat in Cardiff, O'Neill appeared to take a dim view of Arter's stance. In the first part of his press conference yesterday, he even claimed that the midfielder seemed to have already got his view across through the media. The extension of an olive branch is a surprising turn. Perhaps it's an acknowledgement that the PR battle in this episode has been lost, given that Ward's description of events painted a very ugly picture. This is the problem now for the dream team. This autumn was about moving on from the past but it's not just the 5-1 to Denmark or the 4-1 loss to Wales that is hanging over them - instead it's the conduct of Keane during a meaningless end-of-season double-header. O'Neill says he takes "full responsibility" for what unfolded, and he is so far down the road with Keane now that it's implausible to think that he would cut him loose. Instead, there has to be an attempt to present an image of a happy camp. That will be hard. If Arter stays away, it's a problem. If he turns up, all eyes are on him. Ward is caught up in it now. Walters too, although he batted away queries in Wales. The next time any of the protagonists sit out training with a knock, the wisecracks from afar will flow. Anyone with a knowledge of sporting dressing-room - at any level - is conscious that arguments happen on a regular basis. But when they become wrapped up in the story of a management team battling to prove that they remain the right option, and in the aftermath of a disappointingly flaccid display that would have raised questions anyway, then we really are in crisis territory. There is no margin for error now, no room for another controversy. If peace talks even end up taking place, they will have started four months too late. Talking point: O'Neill needs to decide - is it Keane or the group?